The Native Land Court was one of the key products of the 1865 Native Lands Act. It provided for the conversion of traditional communal landholdings into individual titles, making it easier for Pākehā to purchase Māori land. Coming little more than a year after the Waikato War, this legislation was to achieve what many believed had not been accomplished on the battlefield – acquiring the land necessary to satisfy an insatiable settler appetite. The operations of the Land Court affected Māori more than those of any other colonial institution. When old rivalries were played out in court, the ultimate beneficiaries were Pākehā. Historian Judith Binney described the Native Lands Act as an ‘act of war’. The Court was required to name no more than 10 owners, regardless of the size of a block. All other tribal members were effectively dispossessed. The newly designated owners held their lands individually, not communally as part of (or trustees for) a tribal group. They could manage it, and sell it, as individuals and for their own benefit. The first chief judge of the Court, Francis Fenton, maintained that judgements could only be based on evidence before the Court – so all claimants had to attend, whether they wanted to or not. Many Māori racked up large legal bills as a consequence. Those coming from out of town also faced the costs of food and accommodation. Lawyers, shopkeepers, surveyors and the like granted Māori credit while they awaited the outcome of their case. 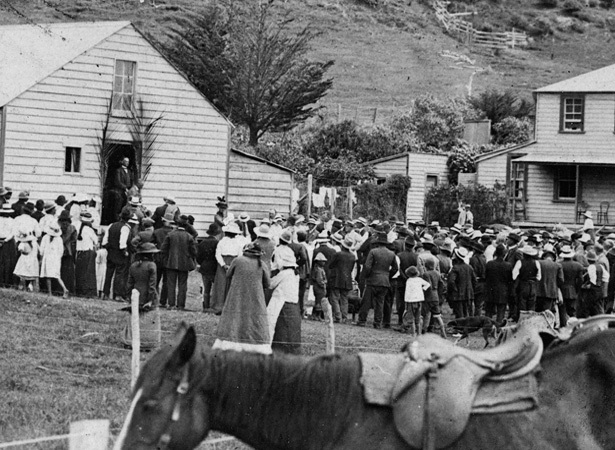 These expenses forced many Māori to sell the land they had been defending in order to settle their debts. destroy if possible, the principle of communism which ran through the whole of their institutions, upon which their social system was based, and which stood as a barrier in the way of all attempts to amalgamate the Native race into our own social and political system. Māori landholdings declined dramatically in the late 19th century. Between 1870 and 1892, 2 million ha of Māori land was transferred to Pākehā ownership. Whereas at the signing of the Treaty of Waitangi in 1840 Māori owned almost all of the North Island, by 1892 they owned little more than a third, and a quarter of this was leased to Pākehā. Another 1.2 million ha of Māori land would be sold by 1900. We have 40 biographies, 10 articles, related to Native Land Court created .